This dish called pata con setas is a pork hock stew with kidney beans, chorizo de bilbao and potatoes. I’m not sure where this dish originate but by just looking at the name of the dish, it is obviously Spanish and I think this is one of the many Spanish influence to Filipino cuisine. But it is a little strange because the Spanish word “setas” is mushrooms which is not in the list of the ingredients. Before I assumed the kidney beans is called “setas” but with a little research the Spanish word for beans is not setas but frijoles. Anyway what is important is the dish tastes good and you can cook it whether simple or special occasion. 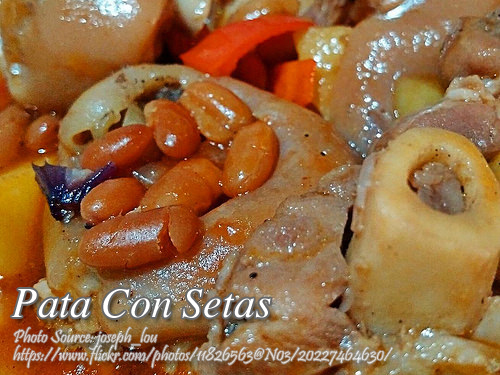 To cook pata con setas; Drain the soaked beans and soak again for an hour. Wash the chopped pork hocks and drain. Place beans and pork pata in a big casserole and add water. Cover and boil for an hour or until the pork hocks is tender. Set aside. In a separate heavy saucepan, heat olive oil and saute garlic, onions and tomatoes until soft. Add the pata (including the broth), Chorizo de Bilbao slices, tomato paste and potatoes. Bring to a boil until the pata and potatoes are tender. Season with salt and pepper. Serve hot. To see the complete recipe, continue reading. Drain the soaked beans and soak again for an hour. Wash the chopped pork hocks and drain. Place beans and pork pata in a big casserole and add water. Cover and boil for an hour or until the pork hocks is tender. Set aside. In a separate heavy saucepan, heat olive oil and saute garlic, onions and tomatoes until soft. Add the pata (including the broth), Chorizo de Bilbao slices, tomato paste and potatoes. Bring to a boil until the pata and potatoes are tender. Season with salt and pepper. Serve hot.